The Harvard-educated crazy lady who showed up in Chicago last week on Cubs GM Theo Epstein's doorstep can't sue us for calling her "crazy lady," it turns out. Kathleen Kearney was named a ward of the state of Massachusetts nine years ago because of mental illness, and she was released on bond in Illinois under the condition she check herself in to a mental hospital. It also turns out that Epstein had previously gotten a restraining order against Kearney, sometime during his stint with the Red Sox. Kearney is the alleged stalker that keeps on giving. 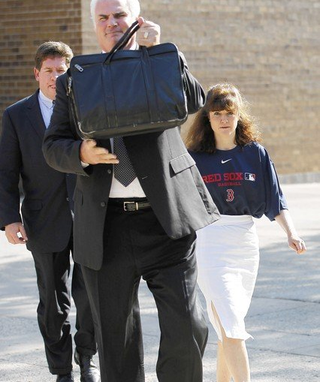 After her wonderful mug shot last week, she showed up to court Monday wearing a Red Sox t-shirt tucked into her skirt.